at the park, capturing a flash mob on your phone, or enjoying singing in a subway, it’s not easy to get your video quality perfect. Sometimes videos suffer from symptoms like “shaky-camera-itis” or “augmented-darkness-levels” that keep viewers from seeing just how awesome your video really is. 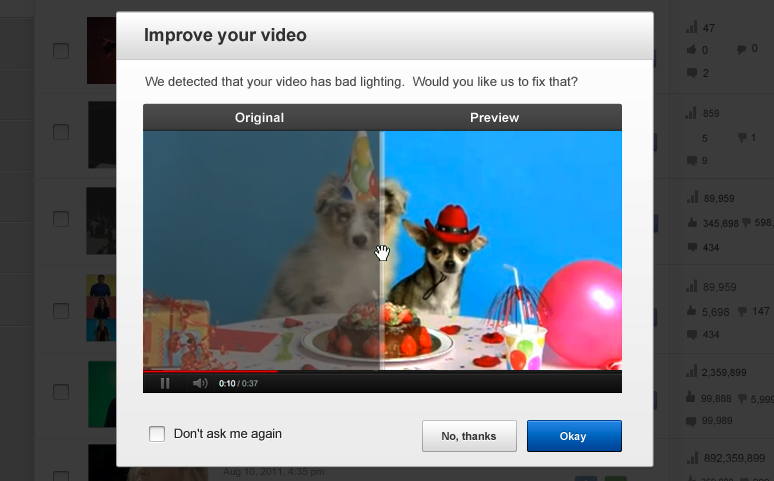 We made a big step last year with the YouTube Video Editor, and now we’re adding a feature that does the work of curing these symptoms for you. It's great if the stabilization works and is quick! I've tried just stabilizing less than a minute footage in after effects and it takes HOURS! Youtube, why did you take away the little + in the corner if the videos and replace it with the clock for watch later? I like to sort my videos into several play lists right from the home page. How about placing the clock in the lower left corner and the + in the lower right so both options are available? Awesome. All we need now is 60fps/60p support. I hope it will soon be available offline in Picasa. well that didnt work well at all...since accepting the fix...my upload is wavy as heck...makes you sick to watch.....greeeat inprovement..NOT! Is it possible that i want live streaming of my tv Chanel on youtube like as IPL live streaming.if some one know about that plzz reply me. Where is the +1 button on this blog?